Apr 24, 2013 Mar 30, 2015 theknotstory2 Comments on Designer Wedding Cards! This post is targeting the audience looking out for wedding cards, by that I mean hardbound wedding cards. In on our blog posts we did tell you about e-invites and Facebook invites and our take on that would follow through. But this is all about hard bound physical cards . These days since money is really not a consideration to spend on weddings people have become very focused about the quality of cards they send out to their friends and family. In early days the cards would be as low as 5 Rs. to 20 Rs. But welcome to the 21st century! So its designer card all the way. Eventually the range of cards have now shifted to 100 Rs. to 5000 Rs. (depending on how much lighter you want you pocket to be). The cards with boxes built-in to add sweets or chocolates are my personal Favorite. They give a neat royal finish to the whole concept of designer stuff. That’s my wedding card. Thanks to the awesome designers at Parampara. 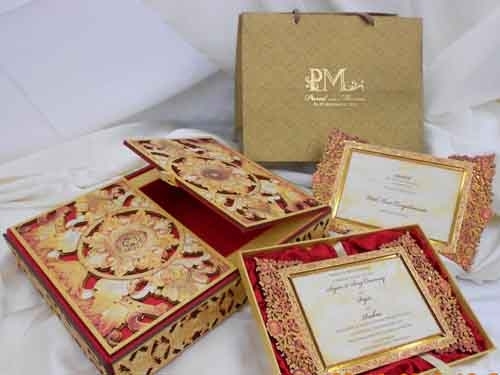 Like the shopaholic mentioned a few blogs back we were doing a wedding of a near and dear one, we ended up getting the card for that wedding designed from the famous “Parampara wedding cards” in Delhi. You can find some great samples on the website too. Remaining details on their website .Go get in touch with them or write to us if you need help for any designers around the country. 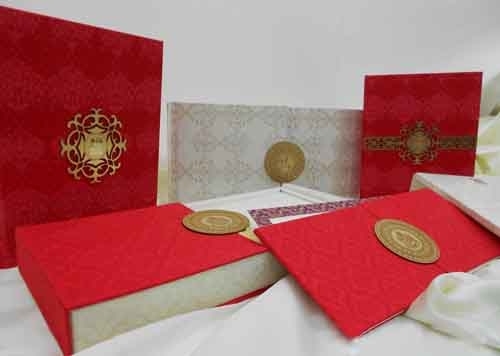 Before I end this blog make sure you get that unique out of the box design for your wedding card from your favorite manufacturer to send across to your in-laws , (like a wooden box with carvings and sweets inside) .It would just make your pocket lighter by 5000 Rs. per card. And We still have cards which cost 5 Rs. to 10 Rs. which you can get in sadar bazaar in Delhi in multiple designs. Previous Post Previous post: Pack Smart – Destination Wedding frenzy! Next Post Next post: Breaking news : Madhuri’s Ghagra ! !